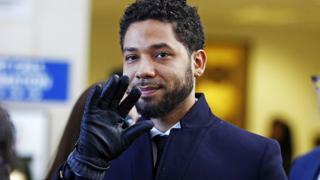 Jussie Smollett has been ordered to pay $130,000 (£99,000) to cover the cost of the investigation into an alleged assault on him in January in Chicago. The actor became the subject of the investigation after he was accused of staging the attack on himself. Smollett has always said he is an innocent victim - the charges against him were dropped earlier this week. But he has now been ordered to cover the costs of police officers, including overtime hours used on the case. CBS journalist Charlie De Mar shared a letter from the city of Chicago to Jussie Smollett, demanding he pay $130,106.15 in the next seven days. In the letter, the police repeated their accusations that Jussie Smollett faked the attack on himself. "As part of the investigation, Chicago police reviewed video and physical evidence and conducted several interviews, expending resources that could have been used for other investigations," it states. "Ultimately, the Chicago police investigation revealed that you knowingly filed a false police report and had in fact orchestrated your own attack." Charlie De Mar also shared a statement he says is from Jussie Smollett's defence team, saying the mayor of Chicago and the city's police chief owe him an apology. After charges were dropped against Jussie Smollett, Chicago Mayor Rahm Emanuel said that he had been given special treatment because of his celebrity status. And President Donald Trump described the case as an "embarrassment to America." The Empire actor has already given up his $10,000 (£7,600) bail payment.